One of the best books I have purchased in a long time is "Artisan Bread in Five Minutes" by Zoe Francois and Jeff Hertzberg you can find a lot of helpful information as well as how to video's at http://www.artisanbreadinfive.com/. Jeff and Zoe have brought bread back to the masses. With a simple fool proof recipe. Since this was my first attempt at making bread, I have absolutely no experience with dough and this recipe couldn’t have been easier. You do need a few items to make this happen, first you need to make sure your oven temperature is correct, it needs to be at 450 degrees, so borrow or buy an oven thermometer to check its temp. Ovens can be off by as much as 75 degrees. Next you need to get a bread stone. You can invest in a really good heavy stone, most kitchen stores will have one, or I have even heard of people using unglazed tiles from Home Depot, they are an inexpensive alternative and when they crack you just throw them out...I figure for all I am saving on bread and pizza I can go for the stone. 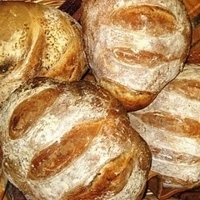 We only need four ingredients for bread, water, coarse salt, yeast and flour. Let’s talk about the flour first. According to the authors all of their recipes were made with all purpose flour, not bread flour. That being said, the next thing you need to know is all flours are not made equal. I use King Arthur’s flour at home for everything else, but it has a very high protein count (11.7), similar to bread flour (12.0). Now I can use it, but I will have to experiment to get the ratio's correct. So why bother and buy gold medal or Pillsbury flour which is closer to the 9.0 range. As for yeast just buy the packets of regular yeast or if you are going to make bread on a regular basis buy the jar, it will be cheaper. Salt needs to be kosher, or Sea Salt, the flavor of the salt really isn't going to come thru so any coarse salt will do. (If you use table salt, use will have to use less because it is more compact). Then we have water, and even if we all dream of using the legendary water of France or Italy, it really doesn't matter; in this case water is water. First get your tap water at about 100 degrees (body temperature), make sure the water is not too hot it will kill the yeast. Colder water is ok it will just take longer to rise, if your letting it sit overnight it really doesn't matter. Now add the yeast and salt to the water and mix it up. Don't worry if all the yeast does not dissolve, it will finish mixing in the flour. Now place your dough into your container, and cover but not tightly and place on the counter for about 2 hours to rise. If you don't have time to wait let it sit out for about a half an hour or so, and put it in the refrigerator overnight, it will rise just more slowly. The dough does need to sit in the refrigerator after the initial rise for at least 3 hours before using. Its best to make it a day or two before you need it, remember this dough will last up to 14 days in the refrigerator, and the older it gets the better it will taste. You'll begin to get more of a sourdough taste as it ages, in fact when you make your second batch don't clean out the container and let the scraps of your original dough speed up the fermentation process..
You may have to experiment a little to get it just right for your oven, but you won't be far off the mark with this as your starting point, I have a convection oven at home but I needed 40 minutes for my bread. I will have to look for the book at the library; I dont' have this one. I use Nancy Baggett's "Kneadlessly Simple"...which is awesome! She has many different recipes in it but the cold rise bread that is baked in a cast iron skillet is my fav! The thing bakes itself-almost, as you said. I love that cookbook. It is the easiest bread I have ever made! Now my teenage step-son makes the bread in our house. Great recipe! I am just now beginning to bake and I think I've caught the bug. Nothing like the satisfaction of making your own bread. Will definitely try this one! I purchased this book last summer and have made several of the recipes from it. I LOVE love LOVE the peasant/rye variations. Also, I found that (sounds bad I'm sure) NOT washing out the remnants of dough from my tupperware box...just mixing the next batch right in...actually made an even better batch on the second round. I haven't tried the specialty breads a la bagels etc but I'm sure they turn out equally nice. Love this recipe! I'm on my second batch. I made bread and pizza out of the first batch and I do believe that the last loaf was the best. I made pesto out of my fresh basil and it was so yummy on the fresh baked bread. Try it! I made this bread tonight, seasoned w/ sea salt and herb de provence. Came out delicious with nice crust and textured interior. Absolutely love this recipe! !I'm about to start my second batch...I suggest to double the recipe as it doesn't go a long way really. You'll be surprised on how fast you ran out of dough. Once you try making your own starter,bake your first ever artisan..you will not stop! From the very first step of activating the yeast up until the last one of slowly biting into that warm rustic bread is nothing but sheer satisfaction! !oh and I've also made it into thin crust pizza, all the same very very good! To avoid that shiny- gummy textured crumb add a little more flour, start with 1/2 cup then work your way through but be careful not to over do it. Otherwise that glorious bread will be hard rock! To achieve that wonderful looking crust, mist/spray the oven a couple of times but only for the first 10 minutes of the whole baking time. Happy Baking! It does look quite a long recipe but seems good to do. I just may have. I love fresh bread, and that looks like it has such a nice thin crisp crust to it.